FRI PhD Entrance Test 2019 - The Forest Research Institute (FRI) Deemed to be University is going to conduct its PhD Entrance Test on 14th July 2019 for enrolment in PhD Program in Forestry. 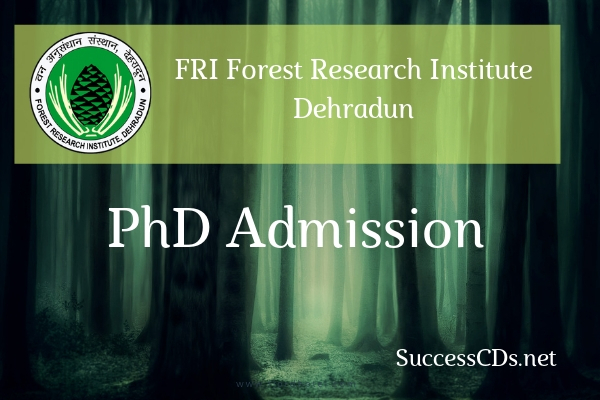 Candidates, who are interested in registration as research scholar for the PhD Degree in Forestry in Forest Research Institute Deemed to be University Dehradun for the term of March 2019. Chemistry of Forest Products (01 Seat); Forest Bioinformatics (01 Seat); Forest Biotechnology (03 Seats); Forest Botany (01 Seat); Forest Ecology & Environment (01 Seat); Forest Entomology (01 Seat); Forest Pathology (01 Seat); Silviculture (01 Seat). Candidates, who are interested for registration as research scholar for the PhD Degree in Forestry in Forest Research Institute Deemed to be University Dehradun for the term of March 2019 are advised to apply in prescribed form latest by 31st May 2019 with a fee of Rs.1000/- through Bank Draft in favor of Registrar, FRI Deemed to be University, Dehradun. No application form will be entertained after the prescribed date. Six-months Pre-PhD Compulsory course would be conducted only once September 2019.